The Lourdas Beach villa is in a great spot just above the bay. Lourdas is a stunning place with a beach that stretches for over a mile, this great villa is a traditional style with a private pool and views across the ocean that will take your breath away. The balcony is a real feature of the Lourdas Beach villa as it affords you some of the best views in Lourdas. The villa sleeps up to 6 people very comfortably and has some great facilities and is within walking distance of the great bars and restaurants in the Lourdas resort to make your stay special. 1. 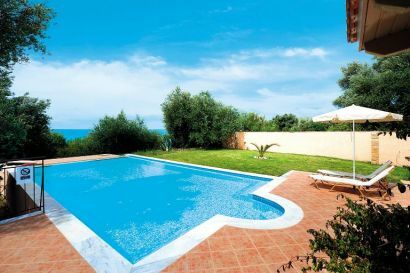 You can check the Lourdas Beach villa availability and package prices at Thomson Holidays. 2. 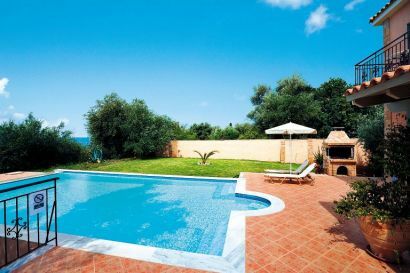 You can also book and check prices at Lourdas Beach villa with First Choice the cheap holiday specialist.